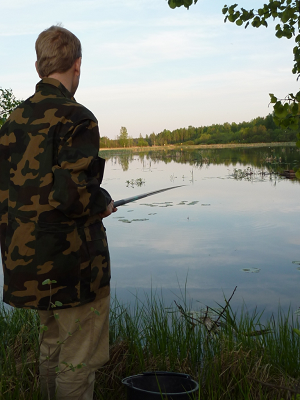 In Finland July and August are the best months for holidays and fishing. There are plenty of fish about and you can fish around the clock if you wish, thanks to our light summer nights. Especially children will also enjoy having fun in the sun, swimming, trekking, having picnics outdoors as well as picking berries and mushrooms. 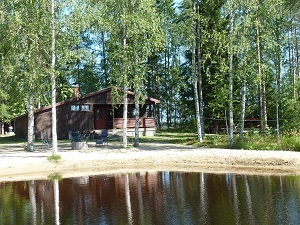 The Saimaa nature, our cottage and the Finnish summer will offer plenty of enjoyment for the whole family. Our holiday week includes accomodation, linens, towels and departure cleaning for max. 6 persons. For independent fishing our cottage customers can use our three fibreglass boats with small motors (4hp, 6hp and 8 hp Mercury) Raymarine fishfinder & chart plotter combos and an assortment of fishing equipment – completely free of charge! Boating and fishing trip for the whole family is a great way to get acquainted with the Lake Saimaa nature and its wonderful views with a big and safe boat, spend some time fishing with your children and enjoy a relaxingly long lunch break on a small island. Lake Saimaa in Finland is the fourth largest lake as well as the largest contiguous lake district in the whole Europe. It is a national treasure of over a hundred lakes and thousands of islands, a unique collage of big open lakes, steep rocky shorelines and an abundance of islands. 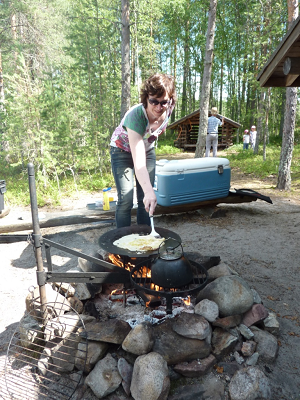 We can help you find out what the northern parts of Lake Saimaa have to offer. You can have a relaxing stay right in the middle of the nature, go fishing for clean and tasty fish, enjoy many quality services and explore the waters and islands of the area by boat. Welcome to our Fishing Cottage on Lake Saimaa! The Fishing Cottage of Old School Trolling is best suited and especially equipped for sports fishermen groups of 4 to 6 people, families or couples. The pond and river waters right next to the cottage are good for independent angling and spinning and the actual Lake Saimaa areas near the cottage are great for spinning and trolling. Our up-to-date fishing cottage is suitable for 4+2 persons, and it is 68 square metres in size. There is a spacious kitchen-living room, two bedrooms, a wood-heated indoor sauna, shower and toilet. One of the bedrooms has two single beds that can be joined to form a double bed; the other bedroom has a 140 cm wide bed for two people. In the living room area there are two single beds and a sofa bed that can be spread into a 120 cm wide bed. The living room also has a fireplace, 32-inch LED TV, home theatre system and a good Wi-Fi internet connection that you can use free of charge. Our fishing cottage is the perfect choice for sports fishermen using various fishing methods. From the cottage shoreline you can successfully do angling and spinning for pike, perch, bream, roach and ide. The cottage is located in the neck of a lake, between Lake Saimaa and a small pond, which are joined by a 6-7 meters wide river. There is no need to travel more than 400 meters from the cottage by boat to find excellent lake area to do spinning, trolling and angling of walleye, pike, perch, and whitefish. 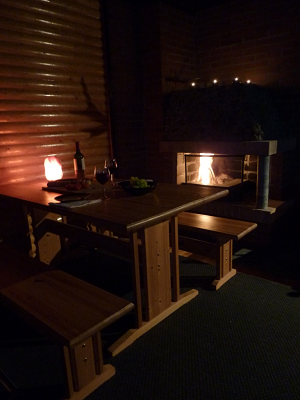 All this you can do in area located less than 2 kilometres from the cottage. 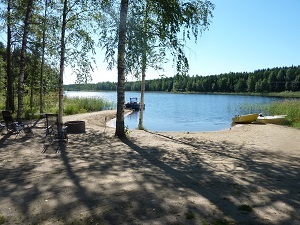 In distance of 4 kilometres from the cottage you can find the Sports Fishing Area of Orivirta. In this area you can find 3 straits and a streaming water area to do trolling and spinning. This area is very popular among fishermen trying to catch bigger walleyes. You can also catch pikes and perches as well as do streaming water angling from the shore or from our cottage boat. Our peaceful cottage is located close to all services fishermen need. 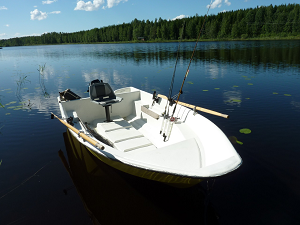 Guests can use small motorboats of our cottage and fishing equipment that can be found in our fishing storage for free. For the use of cottage renters we have three 4,2 meter long boats that are equipped with a 4hp, 6 hp and 8 hp Mercury outboard engines, Raymarine fishfinder & GPS plotter combos, oars, anchor and rope, life vests, landing net, 6 sets of rods and reels for trolling and 6 sets of reels and rods for spinning.In the storage you can also find a freezer and equipment for handling fish. In the storage you can also find angling rods, worms, mash, hooks etc you need for angling in Cottage Jokiniemi. Fishing licenses 15 euros / fisherman aged 18 -64 years old / 7 day period (one rod & lure). 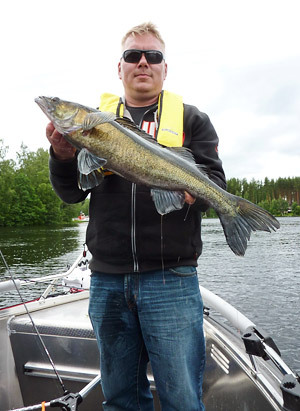 We offer our guests spinning and trolling trips to the fishing waters near the cottage as well as to the bigger open water areas of Lake Saimaa – they are the best way for you to learn the finest fishing spots and the most reliable techniques. Our aluminium fishing boat is especially equipped for spinning. If you’d like to do independent fishing, the cottage has two equipped fibreglass boats with small otboard engines for that purpose. Our sturdy Faster 555 boat that we use for guided fishing trips is powered by a 90 hp Honda motor. The boat is especially equipped for spinning use with Humminbird Side Imaging Fishfinder and Minn Kota Riptide Terrova I-pilot trolling motor. 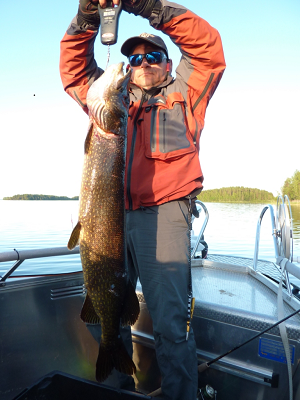 Our fishing guide Jari Kayhko has over 30 years of fishing experience on Lake Saimaa waters. 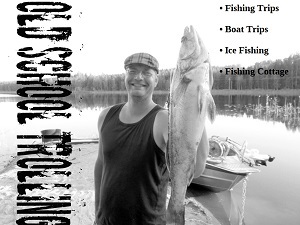 He specializes in trolling of landlocked salmon, zander and pike as well as spinning of zander, perch and pike. 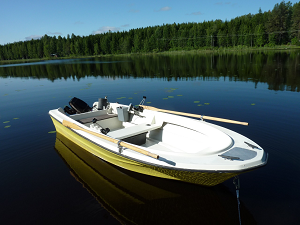 Read more about boat and fishing trips on Lake Saimaa! Raikuu canal is one of the canals, that was made by local people more or less in the middle of the 1700 -century. Take part to boat charter to the beautiful Raikuu Canal and the unique WWII-era defence line called Salpalinja (Salpa Line), incl. outdoors picnic by campfire. Read more about Raikuu Canal and Salpa Line area! Due to its location and character the Orivirta sport fishing zone is best suited for softbait spinning off a boat for walleye. The area of streams is also excellent for purposes of trolling walleyes, pikes and perches. Distance from Cottage Jokiniemi 4 km on water or 3 km by road. Kerma Rapids, 40 km from Cottage Jokiniemi. Kerma Rapids are one of the most challenging fly fishing destinations in Eastern Finland for seasoned fishermen. 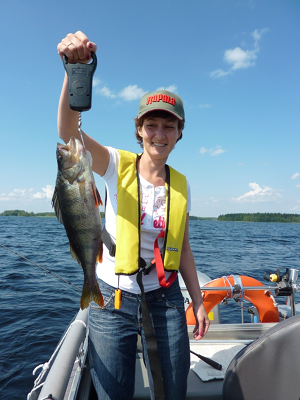 Fishing season: 1 st of May-10 th of September and 16 th of March - 30 th of April. The total length of the fishing zone is 1.5 kilometres and the difference in water level is 1.8 metres. There is a good food store, restaurant services and a public boat launching ramp within 2 km from the cottage. Fishing Cottage on Lake Saimaa! Romantic open fire place and dining area. 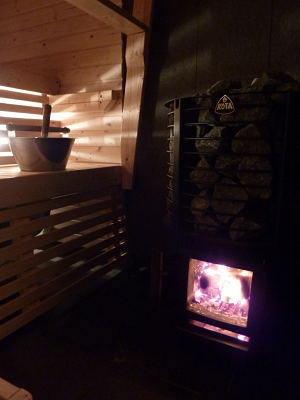 Enjoy the atmosphere and sensitive heat of our sauna. 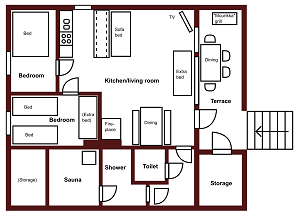 Layout of our Fishing Cottage on Lake Saimaa. 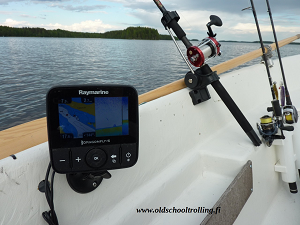 Our fishing boats are equipped with Raymarine fishfinder & chart plotter combos. 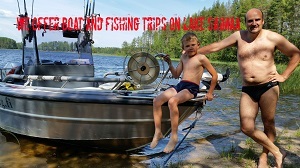 Fishing trips for children on Lake Saimaa. Boating trips for whole family on Lake Saimaa. Interested in the big perches of Lake Saimaa? The best perches for cooking are 200 to 900 grams in weight. We recommend that you release perches bigger than 1 kilo as they are valuable for breeding. We suggest that each fisherman keeps max. 1 to 3 kilos of perches per day. With us you can go spinning or trolling for pike. We recommend that you release very big pikes that weigh more than 8 kilos or are longer than 1 meter, because these big pikes are important in terms of reproducing new healthy pikes and keeping the eco system as well as the number of other species of fish in good balance. For food, we suggest that each fisherman keeps max. 2 or 3 pikes of 2 to 4 kilos per day. Come with us to do softbait spinning for zander! We recommend that you release zanders that are shorter than 50 cm or longer than 75 cm. This way the smaller zanders will reach the age of maturity and the bigger zanders have the opportunity to reproduce many times. We suggest that each fisherman keeps max. 2 zanders per day. From October until the end of November we can take you trolling for landlocked salmon and brown trout. We only keep the fish that have had their adipose fins cut out and release all wild landlocked salmon and brown trout species that still have the adipose fin, as they are endangered species. Minimum landing size is 60 cm for both species. 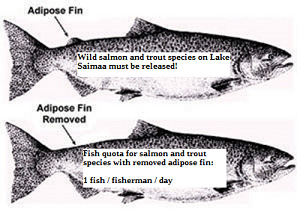 Prohibition on fishing of landlocked salmon with removed adipose fin: 1st June - 31 August! Traditional float angling at Fishing Cottage Jokiniemi. 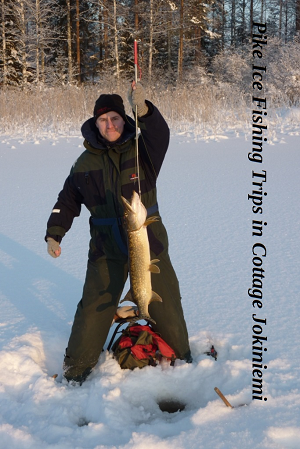 You can catch rudd, roach, bream, ide and perch at Cottage Jokiniemi.